The Long Version: I got this neat foamcore presentation board a few days ago and finally tried it tonight. I like how it is more compact when stored than it's total area, and is bigger than the poster board I previously used for product/macro photos which allows larger items and more generous cropping. It's very well made, sturdy, and most importantly is free-standing on floors and tables and even on carpet. And the wings can be used to block your side light sources from hitting the background, which is great. For tabletop use you can turn it 90 degrees and use one wing underneath smaller subjects. I'll be getting a white one soon, and looking at the other color choices next time I visit Office Max where I got this for half of it's $14 MSRP due to a savings card. Pretty sure it's also available at Office Depot, Staples, and other stores of that type. 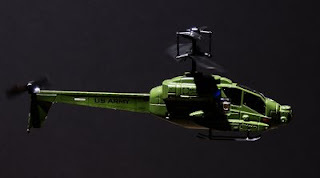 My new AirHogs™ Apache helicopter is flying fairly close to the Elmer's background here, and the light is coming from a flash suspended just above and in front of it, which is the worst case scenario for any background material. You can also see one of the "hinges" quite plainly. Seamless paper it isn't, but neither is the price. With an extra foot of subject/background separation there is much more smoothness due to the background blur nature of zoom lenses used in this range of close work. (I was using a Sony 18-70mm 'kit' lens on my Alpha 300 DSLR, and was zoomed to various points in the middle of it's range while at approx. 2 meters from the background for all photos--the copter's distance varied). I knew I would like this product, and all testing thus far confirms it. A horizontal test will be performed soon. Hopefully a big lawn/leaf garbage bag can be used to keep it free of dust and scratches when not in use. The middle photo over there shows the 'copter even closer to the camera for an even smoother background. There is still some texture visible but I attribute this to the angle of my off-camera flash--the Elmer's background's surface is much smoother than cheap poster board although it's definitely lumpier than standard foamcore. But it's bigger and more convenient to use, so just light it more carefully. 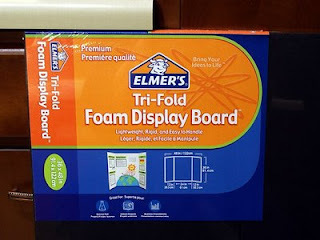 Good tip on the foam board - I'll look for it next time I'm at my local art/business/school supply store. 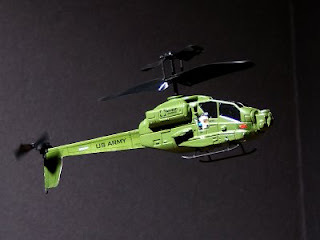 And I've been tempted to buy one of these remote-controlled helicopters myself, but eventually I have to admit to myself that I'd only use it for fifteen minutes before I put it down and never pick it up again. I have lots of things in boxes, some dating back to my late teens, that I'd theoretically like to do again but know that I just won't do it. I still play with my copter maybe once or twice a month. For me the fun is trying to figure out ways to gently modify the flight characteristics so it's different and still challenges me every time I charge it up. A tiny weight here, a piece of tape in the propwash there...good times.